By the time these words hit the stands, the president of the United States will be in Israel. This has not been as anticipated a trip as in the past for a few reasons; Barack Obama has been spending quality time on the phone with Israeli Prime Minister Benjamin Netanyahu as the U.S. continues its anti-Iranian nuclear rhetoric and running point on crippling international sanctions, the American public has bottomed out its interest in Middle Eastern affairs for the first time since 9/11, and all eyes have been on the slow crawl to attain some measure of a federal budget here at home. But, make no mistake; this visit will have its repercussions. Firstly, long before the 2012 election season, this administration has turned its trade/energy/negotiation attention away from the primacy of the Middle East and focused it on Asia, where for years economic forecasters have pointed to it as the New Europe. In fact, even mother oil has become more important to the energy concerns of China (having eclipsed the U.S. for the world’s largest oil importer) and India than it currently does to the U.S. 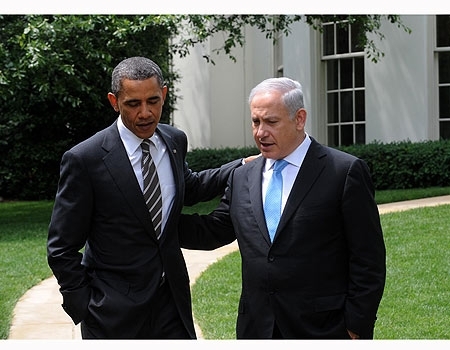 This has added to the already strained relations between the Obama Administration and Israel. Most of Netanyahu’s posturing, including his over-analyzed, behind-closed-doors harangue against the president during a 2011 U.S. visit, has centered on Israel’s concern for Iran’s nuclear capabilities, but politically it is imperative for the brash prime minister to keep U.S. fears of an insane Middle East percolating. Pressuring Iran has internal consequences for Netanyahu as well, if merely to appear tough to Palestinians; an act of personal relevancy that has served him well over several terms. Netanyahu, no fan of former Secretary of State Hillary Clinton, who openly supported a Palestinian state, now has to deal with newly confirmed Secretary of Defense Chuck Hagel, who represents the U.S.’s new and improved “anything but war” stance. Something the American people now overwhelmingly support and by default reflects an expedient solution for a nation with less available funds than a will to fight someone else’s battles anytime soon. Next is the mere fact that there are bigger fish to fry in the Middle East. The key question remains whether or not Syria, Egypt, Lebanon or Iraq will maintain its solvency as working states in the grand scheme of international diplomacy. Deeply contentious Shiite and Sunni religious/cultural civil war is now front and center in all-things Arab Spring, which handcuffs any Western interference. With the outcome in serious doubt and no obvious ally emerging, the last thing Obama wants to do on this trip is appear gratuitous. Any commentary on this matter, even on a chummy diplomatic sojourn, can be counterproductive. These are the types of trips that can distract a president from more pressing issues and weaken his domestic position. Yet, there is no way to escape the most explosive aspect of this disaster; Syria. It is a killing field rife with intrigue between Iran, Hezbollah, and the Syrian government. All three factions are attempting to crush the “rebels”, whom the United States have supported rhetorically, but with no plans to add weapons — mainly due to Israel’s horror that those weapons could be used against its interests. Syria will be the giant elephant in the room when Netanyahu and Obama chat, but there is little chance the details of those chats will not have already been determined before Air Force One hits the Holy Land. But what will ultimately stare the president directly in the face is the 300,000 Israeli settlers in the West Bank. Obama has held fast in his opposition to the expansion of Israeli settlements there, a neat balancing act for the leader of a nation that kicked indigenous peoples off their land. In a similar show of our convenient Manifest Destiny two-step, Netanyahu has no designs on reversing Israel’s course to colonize the region and ignore the 2.5 Palestinians that also call it home. This will make Obama’s meeting with Palestinian President Mahmoud Abbas an interesting study in appearing not to play favorites. Explaining personal ideology that speaks directly against U.S. policy has been a favorite task of the presidency dating back to George Washington’s famous farewell address. It is this tightrope walk, in the shadow of the Iranian mess, that makes Obama’s Israel trip so intriguing. What critics have dubbed the White House’s “maintenance trip” due to the failure of having even a tertiary peace initiative, there appears to be no directive here beyond face-saving. Yet, it is no time for a misstep, which can harm the president politically at home, as he maintains an edge in popular support over Republicans in the battle to balance the budget, reform taxes, propose immigration reform and introduce a measure of gun control into the legislative discussion. But polls are beginning to show an erosion in the post-election high and soon the ramp-up to the 2014 mid-terms will force members of both parties into local political fights that will all-but halt any second-term agendas. These are the types of trips that can distract a president from more pressing issues and weaken his domestic position. Republicans, who have failed to paint this president as a weak foreign policy commander-in-chief, would love nothing more than this thing to go sideways, ala Mitt Romney’s pre-campaign Britain trip that made him look like a piker and effectively sabotaged the first weeks of his presidential run. Let’s face it; this is bad timing for Obama. He does not need this kind of pressure, but he spent a boatload of money and time fighting to retain this gig, and there will never be a good time to pull off a balancing act of this magnitude.